A guest chef for brunch, bathing beauties and wedding vows are all on the calendar for Hotel Galvez & Spa®, A Wyndham Grand® Hotel, this spring and summer in Galveston. As the island warms up for the season, Hotel Galvez finalizes plans for the Galveston Island Wine Festival April 26-28, the Galveston Island Beach Revue May 17-18 and the Galvez Wedding Vow Renewal June 8. Hotel Galvez & Spa has partnered with Yaga’s Entertainment to offer a weekend package and a special brunch in conjunction with the Tenth Annual Galveston Island Wine Festival April 26-28. Hotel Galvez & Spa is featuring special menu items created by Executive Chef Lance Fegen on Sunday, April 28. Fegen is culinary director of F.E.E.D. Texas and executive chef for Liberty Kitchen Restaurants. The weekend package includes two tickets to the Festival’s Grand Tasting on Saturday, and Sunday Brunch for two. Sunday Brunch is $44.99 for adults, $39.99 for seniors (aged 60 and up) and $26.99 for children (aged 6-11). For reservations for brunch, call (409) 765-7721 or book via OpenTable.com. Book the weekend package at HotelGalvez.com (see offers). The Galveston Island Beach Revue presented by Hotel Galvez & Spa returns May 17-18 offering a weekend of vintage themed fun. The weekend begins with the Friday Revue Preview from 6 to 7:30 p.m. The public is invited to sport their favorite vintage attire as they enjoy live music by Harlem-based jazz singer and band leader Dandy Wellington. The evening is highlighted by the introduction of the 2019 Bathing Beauty Contestants at 6:30 p.m. Organizers award prizes for the best vintage wear. On Saturday, the Beach Revue continues at Beach Central, located directly across the street from the hotel, from noon to 7 p.m. Activities include a hot rod and classic car show, food and drink vendors, live music and culminates with crowd favorite, Bathing Beauty Contest at 5:15 p.m. Guests can cheer for their favorite contestant during the contest as thirty bathing beauties compete for cash prizes. For a detailed schedule, visit https://www.galvestonbeachrevue.com/. 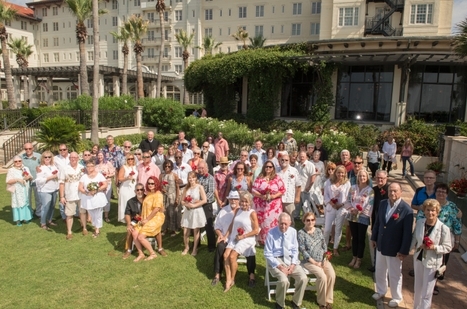 Hotel Galvez invites couples to renew their wedding vows during its ninth annual Wedding Vow Renewal on Saturday, June 8. The hotel offers a weekend package or couples can opt to participate solely in the ceremony, which begins at 10 a.m. There is no fee to participate in the ceremony although couples must reserve their spot in advance. The hotel hosts a reception for participating couples following the ceremony. For reservations, call (409) 765-7721. See special offers to book the Vow Renewal weekend package which includes champagne upon arrival and souvenir champagne flutes. Travel is the best excuse to enjoy the grand things in life. With locations in some of the world’s most sought after vacation destinations - including Shanghai, Istanbul, Doha, Salzburg and Orlando - Wyndham Grand® hotels transform ordinary moments into unforgettable experiences. Decidedly not stuffy, but approachable by design, this upper-upscale hotel brand helps travelers make every moment count. The brand’s one-of-a-kind family program, Reconnected, a Wyndham Grand Family Experience, challenges kids and parents on vacation to put memories first by doing the seemingly impossible: putting the phone away. Addressing the need for quality time over screen time, Reconnected offers families on vacation the one amenity that really matters: time to simply celebrate being together.